So I had my fun in the iCafe, but it wasn't long after that the word got around that I had experience as a plumber. Before long, I had a few of the engineers approaching me to ask if I would like to come join the plumbing team. 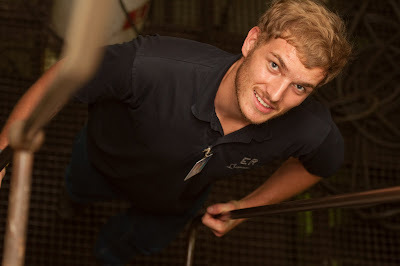 Well, surprise, surprise, I'm now one of three plumbers on the Logos Hope! It has been about three weeks since I officially started working as a plumber, and so far so good! Jérémie and I had the privilege of designing the logo for the new shirts that we're ordering! This is what we came up with! 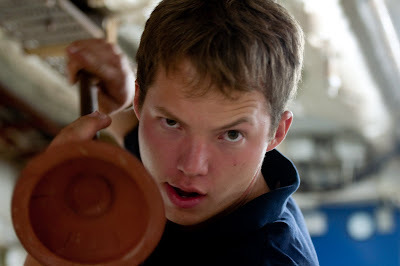 There are three of us in the plumbing department on the ship now. Below is Jo from France. He's hilarious and I enjoy working with him most of the time! He doesn't speak super strong English so at times it can be a little difficult. The engine room is always very warm. If I had to guess, I'd say that the temperature probably is about 80 degrees on average. The generator room is even warmer than that! The ship doesn't get electricity from the port, ever. All of our power is generated right on the ship. Right now I don't spend a lot of time down there, but once we get more supplies for the upcoming projects, I'll be spending more time down there. Right now I'm doing service work all over the ship. Every day is different which I really enjoy. Tomorrow I'll actually be preparing to lay tile in the galley! 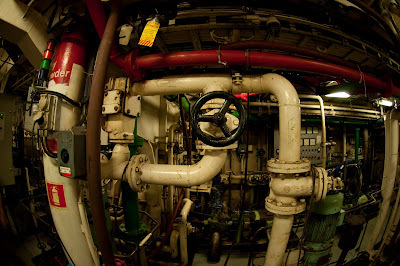 The sheer amount of pipes for all of the systems on board is crazy! Everything from black water, grey water, emergency pumps, fresh water, reverse osmosis, etc.. It's going well and I really feel like I can serve better as a plumber then as an iCafe team member just because plumbing is something that I have the ability to do. Since I have the chance to serve through something that I have experience in, it just enables me to make a bigger difference. Keep me in your prayers because at times the job can be quite daunting! I'm praying for you Ben! Thanks for the updates! !